In Honeymoon Travels Pvt. Ltd., six newlywed couples begin to make the adjustment to married life. These crucial first days of marriage are pivotal for everyone - some marriages grow stronger, some don't even make it through the film, and others come out somewhere in between. For the viewer, though, the journey is delightful - tasty and sweet, and a little bit salty too. Traveling together on a package honeymoon to Goa, the film's six couples run the gamut. Hitesh and Shilpa's (Ranvir Shorey and Diya Mirza) marriage was arranged, but Shilpa won't stop weeping, and the more she cries the angrier Hitesh gets. Aspi and Zara (Abhay Deol and Minissha Lamba) are childhood sweethearts who have never had a fight - but more than that makes them a little different from everyone else. Pinky and Vicky (Amisha Patel and Karan Khanna) are young and raw; Pinky is a dreamer, and Vicky doesn't really know who he is. Bunty and Madhu (Vikram Chatwal and Sandhya Mridul) met on the internet; both are recovering from heartbreak, but they have a lot to learn about one another. Partho and Milly (Kay Kay Menon and Raima Sen) both need to loosen up before they can learn to be happy. Finally, Naheed and Oscar (Shabana Azmi and Boman Irani) are fifty-ish and on their second marriage; they have seen one another through some very tragic times and are ready to face the world together. Oscar and Naheed provide the anchor for the film, not just because they are played with perfect tone and timing by two of India's most talented actors, but also because their sad backstory brings to the group the gravity of life experience that the other couples have not yet weathered. 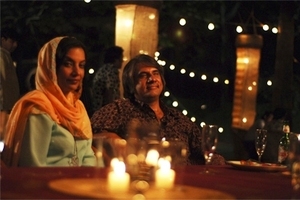 In one of the film's pleasing mini-arcs, Naheed and Oscar first draw titters and whispered comments from the other couples, tickled by the idea of "oldies" on their honeymoon; as the story advances, though, they seem to lead by example, and the younger newlyweds come to look up to them as a model couple, both pragmatic and ideal. Indeed, Naheed gets the final word in the film, a slightly heavy-handed but very touching summary of the film's message about love and openness. The other couples lack Oscar and Naheed's grounding and so some of their stories are left unresolved at the end of the film. One of the couples appears to have reached an uneasy compromise; though they are content at the film's close, it is still clear that their marriage may be stuck in unnavigable waters. Another couple is left to face difficult times as they get to know themselves and one another. This is not a weakness in the film, however; it is appropriate, and true to the subject, as the problems in these marriages (as in real marriages) are too complex to achieve more than a superficial resolution in a two-hour film. Any attempt to tie up the threads of every marriage would have seemed facile and false. Instead, Honeymoon Travels takes leave from its characters at a moment of contentment, which the audience knows is only temporary for some of them. The film's music, by the team of Vishal-Shekhar, was excellent too, setting the light, fun tone from the opening credits, set over the infectious straight-up funk "Albela albela," one of the two best songs in the soundtrack. The very best song comes toward the end of the film - "Sajnaji vaari vaari" is a free and sun-soaked celebration in which all of the honeymooners participate, some with more loosened inhibitions than others. There is also a smoking salsa number and a couple of gentle love songs to round out the music. The performances of the young actors were adequate, with one exception. If there is one weakness in the film, it is the performance of Vikram Chatwal, whose delivery is wooden and expressionless, weakening the important and challenging arc of his character Bunty and of Bunty's marriage to Madhu. Still, most of the others are up to the task presented to them, especially Kay Kay Menon and Raima Sen, whose strait-laced, nervous Partho and Milly undergo perhaps the biggest transformation in the film. Honeymoon Travels has been criticized for a lack of depth and focus, but this strikes me as unfair. The film is not trying to do too much; it never takes itself seriously and operates in a cinematic universe that is self-consciously a little different from the real world. Judged on its own terms, Honeymoon Travels is light, gentle, and very, very funny; often sweet, and a little magical. It is a fully enjoyable ride. Honeymoon Travels was my 20th Shabana film!